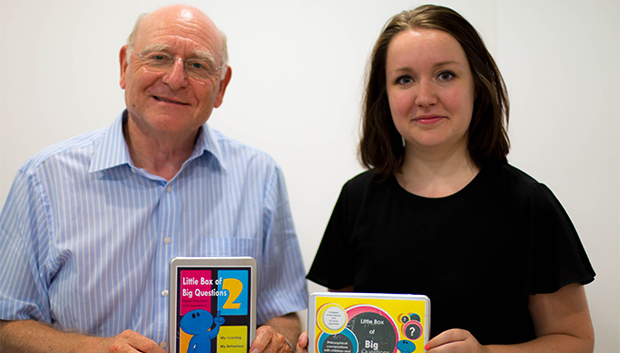 The Little Box of Big Questions A UEL psychology professor and one of his former students have produced a series of cards, intended to help children and young adults tackle life’s big questions. Little Box of Big Questions 2: My Learning, My Behaviour, My Future was devised by Professor Irvine Gersch and educational psychologist Dr Anna Lipscomb. Each card carries a set of questions, which have been formulated to prompt philosophical conversations with children and young people (aged 8-18). The cards cover topics such as the child’s mission and purpose in life, the way in which they learn, and the rules which govern their behaviour. The questions include, “How do you tell whether a fact is really true or not?”, “How do you feel when you break a rule?” and “What activities do you enjoy doing at the moment?”. The choice of questions was informed by several research projects carried out by UEL students. The box was published by Small World - Big Imaginations Ltd, and is intended for use worldwide in schools, and by educational psychologists, parents, teachers and those working with children and young people. “We believe that children and young people need time, space and kindness to speak openly about the things most important to them,” explains Professor Gersch. “We can understand young people better when we listen carefully to their responses to the 'big' questions in life. This can help us understand the root of their thinking and behaviour and can give us insight into how best to support them to reach their potential”. Dr Lipscomb, the co-author of this resource, is a former student of Professor Gersch who completed her doctorate in Educational and Child Psychology at UEL. Upon graduation, Dr Lipscomb went to work as an educational psychologist. She stayed in touch with her former project supervisor and collaborated with him on this project. This new release follows the successful publication three years ago of Little Box of Big Questions; Philosophical conversations with children and young people. The authors plan to produce a third volume for adults, (LBBQ3), to help them with decisions at major points of change in their lives.